1. The transmission system of the 40-45HP wheeled tractor is produced with advanced European technology. 2. Possessing outstanding reliability and durability, our paddy field tractor has 3/4-cylinder direct injection diesel engine. In addition to the large torque, the device features low energy consumption and environment protection. 3. The gear drive is 8F+4R. Specially, the gear configuration for the product of YTO-454 series is 8F+8R. 4. By virtue of the outstanding sealing mechanism for the front drive axle, the 40-45HP wheeled tractor is an optimal choice for operation in paddy field. 5. The hydraulic lifting system of the agricultural wheeled tractor is manufactured in compact structure. So, the operation and control of the product is flexible and easy. 6. Safe and reliable, the hydraulic steering system can be manually controlled. 7. 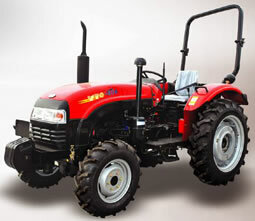 Our four wheel tractor has passed E-Mark certification.